Skinny Jeans & a Chai Latte: Food & Beer Friday :: Another stout. i've had this one. so good. i just wish i wasn't hungover right now and looking at this picture didn't make me want to puke. Ugh stouts kill my stomach! But my husband loves them...he'd love this one if I could grab it off the screen and surprise him with it! I will never get sick of stouts. I want this stout in my belly immediately. dark chocolate/coffee stout?! i'm in! Awesome! That sounds SPLENDID! Maybe I'll try to find it or something similar this weekend...the husband is away so that sounds delightfully chocolaty GOOD! I'm currently sampling Blue Moon's Valencia Grove Amber, which is described as: roasted malts, Valencia orange peel, and a touch of wheat for a hint of citrus that’s ripe for the season. DELICIOUS!!! 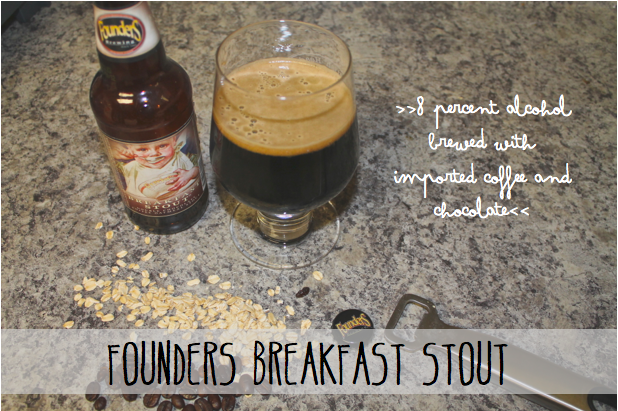 I've never even heard of a breakfast stout. I'm going to have to hunt this one down! Oh geez, that chocolate bar. And I still have yet to drink Terrapin's Wake and Bake. I seriously need to get on that. I love this beer! We had it on Saturday, picked it up from our neighborhood store! So delicious, except I was so full after drinking half the pint! It is a hearty beer! I am a big fan of the Breakfast Stout! It's one of my favorites!